Troisti muzyky [троїсті музики; trio musicians]. A trio ensemble of folk musical instruments consisting of violin, bass viol (basolia, folk violoncello), and frame drum. In Western Ukraine the tsymbaly (cimbalom) was commonly used instead of the bass viol. On occasion the sopilka (fipple flute) replaced the violin as the leading instrument. 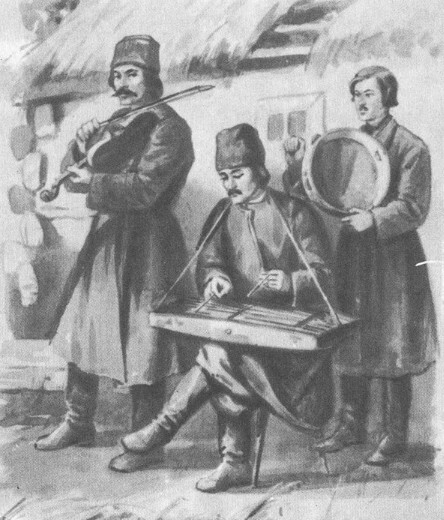 The trio ensemble arose after the violin was introduced into Ukraine early in the 1600s, and became widespread by the end of the 17th century. Until the beginning of the 20th century troisti muzyky provided most of the musical entertainment on feast days, and at weddings, birthdays, social gatherings, and fairs. Their repertoire consisted of dance music and folk songs. Today the tradition is maintained by musicians in such ensembles as the Kyiv Orchestra of Folk Instruments.